In Portland Oregon's beautiful Rose City Cemetery, there is a section of Gypsy graves. The monuments on these graves are interesting enough during most of the year because of the photographs of men in big hats smoking cigars, and ladies in scarves toasting us with wine glasses that are displayed on many of the large monuments. 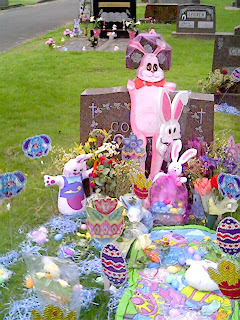 During Christmas and Easter, though, the graves take on a life of their own as they are decorated with an unbelievable amount of baskets, candy, cigars, bunnies, full sized artificial Christmas trees and toys. This always looks odd next to the quiet graves nearby, but think about it, and it makes a lot of sense. Even though our dead are gone, they live on in our minds and memories. They are still in our thoughts and in our lives, just as they were when alive. Our dead are in our thoughts especially during the holidays. Maybe if more of us had a ritual that kept our dead as a part of our holiday traditions, the holidays wouldn't be so difficult to enjoy without them.